Paisley after he kept his seat in parliament. WHILE THE DUP has been making noise in Westminster of late, one of its senior MPs has been very quiet on the Brexit issue. Ian Paisley Jr. has been dealing with problems of his own, and they show no sign of abating. Problems, it must be said, completely of his own making. Paisley’s latest series of troubles began in September 2017 when an article in The Daily Telegraph alleged that he accepted “two all-expenses paid trips from the Sri Lankan government” in March and July 2013. He did not register the trips and in the year afterwards he lobbied on behalf of the Sri Lankan government. The House of Commons deemed this to be paid advocacy and in July last year Paisley was suspended for 30 days. His suspension led to parliament’s first ever recall petition, which Paisley survived by just 444 signatures when almost 10% of constituency electors voted to remove him. Last month, BBC Spotlight aired a report on Paisley alleging that he took a free holiday to the Maldives and again advocated on behalf of its government. The House of Commons has again been asked to investigate. Then last week, the Irish News reported that a Belfast charity paid for Paisley to fly first-class to New York for a peace event, while others like Minister Simon Coveney flew economy for a tenth of the price. A succession of revelations like this would usually spell the end for most normal politicians, but of course given his name in the party he inhabits, Paisley is far from a normal politician. Untouchable or not, his reaction to the various revelations has been even more bullish than you might expect – usually delivered through his local paper The Ballymena Guardian. This week he told the paper that he “put himself out” by making the first-class trip to New York because he was “asked at the last minute”. It followed a similarly forceful statement to the paper after his Commons suspension when he said that “a smaller man would have crumbled” after the punishment. It even extended to Twitter, where he briefly changed his Twitter bio to say he received “90.6% support from recall petition”. A generous spin, to say the least. But long time followers of Paisley will not be surprised that he seemingly hasn’t learnt from past behaviour. Writing in TheJournal.ie last year, writer and lecturer Thomas Muinzer outlined that revelations about his dealings have dogged his career. “The primary reason that Paisley Jr ran for his Westminster seat in the first place in 2010 was that he had been a junior minister in the Northern Ireland government, but was compelled to resign over cash and cronyism allegations connecting him to an affluent North Antrim constituent, property developer Seymour Sweeney,” Muinzer wrote. Although ultimately cleared of any wrongdoing by a Stormont ombudsman’s investigation, which found that he had not broken Northern Ireland Assembly rules, it came to light that he had purchased a holiday home from Sweeney in a period when he was also pressing Tony Blair and others to support Sweeney’s intentions to build a private visitors’ centre at the Giant’s Causeway. It also transpired that he and his father had been due to rent a joint office funded by public money, reported to be at the startlingly high rate of approximately £56,000 per annum. It was revealed that this office was initially registered to a company directed by Sweeney, until Paisley Jr’s father-in-law Jim Curry replaced him as director. What’s notable about all those examples is that Paisley continued to represent his party throughout, successfully it must be said having been re-elected repeatedly. Given that electoral backing, his party is likely to stand by him now as well, even if the questions continue to pile up. Last month, Arlene Foster said that the DUP’s officers will be “looking at” the Maldives allegations, describing them as “very serious”. Whether this means he’ll face repercussions remains to be seen and will perhaps depend on whether another House of Commons investigation follows. Or indeed how much of a distraction he becomes for the party. Even then though Paisley may survive, he’s done so before. Email “Ian Paisley Jr may be indestructible but he's increasingly becoming a sideshow”. 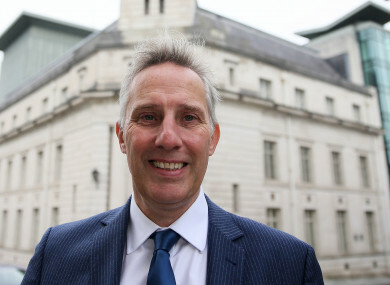 Feedback on “Ian Paisley Jr may be indestructible but he's increasingly becoming a sideshow”.